Oxymetholone 50mg x 20tablets Oxymetholone (Anapolon,Anadrol, Oxy) made by Abdi Ibrahim is a synthetic anabolic steroid developed in 1960 by Syntex. Clinical applications include treatment of osteoporosis and anaemia, as well as stimulating muscle growth in undernourished or underdeveloped patients. 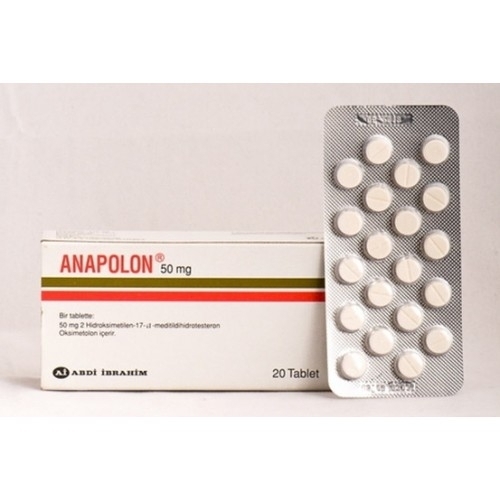 Anapolon is the strongest androgenic steroid available and is highly effective in promoting extensive gains in body mass, mostly by greatly improving protein synthesis. Many athletes also use Oxymetholone as a means of safeguard with the joint capsules underneath heavy loads. Due to the high water retention users experience from this drug, the item in the same way lubricates the actual bones and allows defend them from injuries. Oxymetholone is widely considered by bodybuilders to have the strongest anabolic effect out of any oral steroid available weight increases of 20 pounds in 2 weeks are not unheard of with this drug. Anapolon is one of the few steroids where the dose respondent curve flattens out very quickly. 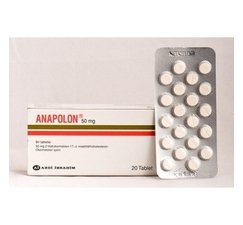 When you take 50mgs of Anapolon, you´ll make some very good gains. When you take 100mgs of Anapolon, you´ll make even more gains.